Olivia Markman and Glynhafan Red Kestral accept the award with Sarah Markman for the win in the $2,500 USHJA Pony Derby. Crete, IL – June 20, 2017 – Showplace Productions hosted their traditional Derby Day during the Spring Spectacular III Horse Show. The entire day is dedicated to hunter derbies, as only two rings run the entire day and are set with perfection and attention to detail, making for a special day. Pony riders and Children's/Adult riders took over the main hunter ring for the $2,500 USHJA Pony Derby sponsored by the Markman Family and the $2,500 Balmoral Children's/Adult Hunter Derby while the Grand Prix ring featured the $25,000 USHJA International Hunter Derby sponsored by Bull Run Farm and the $10,000 National Hunter Derby sponsored by Galway Farm. With riders decked out in shadbelly coats and horses groomed immaculately, each horse and rider combination had their chance to ride the beautiful derby track to earn high scores during the World Championship Hunter Week. 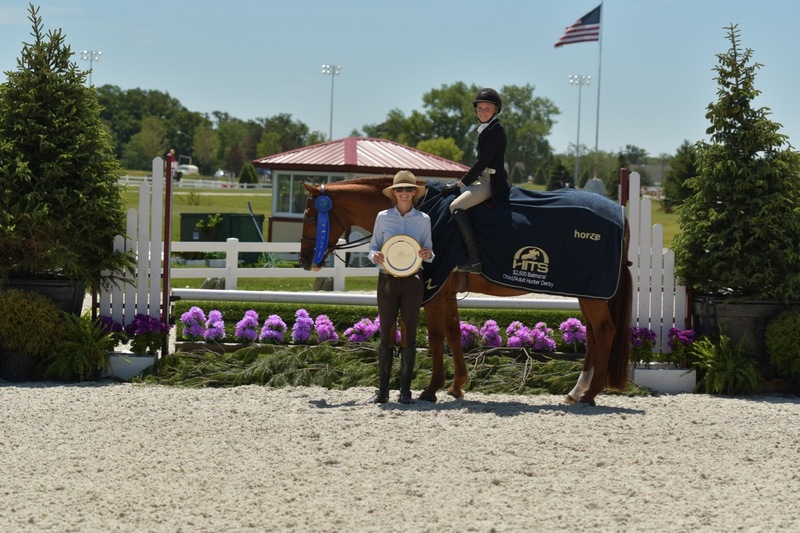 Young rider Olivia Markman, 12, of Chicago, was on her mark as she went two for two to win both the USHJ Pony Hunter Deby and the Balmoral Children's Adult Hunter Derby. 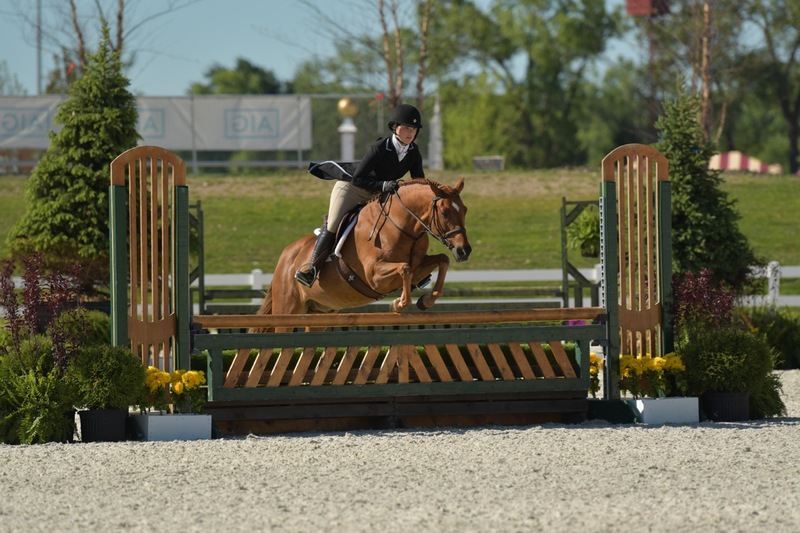 Markman's day started out with a score of 84 in the first round of the USHJA Pony Derby aboard her Glynhafan Red Kestral. Coming in with the second highest score in round one was Britta Stoeckel and Jessandi Famous Amos with a 75. In the handy round, Markman again knocked it out of the park with an 85. Stoeckel was hot on her heels scoring an 82, but not enough to catch the winner. Both riders ride at Littlewood Farm with trainers Joanne Kurinsky and Katie Kunk in Libertyville, Illinois. "Every time we sponsored the derby I didn't do so well but today I finally did," laughed Markman. "The derby was really fun! He [Glynhafan Red Kestral] is really good at helping me find the distance because I don't always see it. I've had him a little over a year now." Markman has been doing well with her pony this season and already has several championships under their belt. They showed at the Winter Equestrian Festival and won a few large pony classes there and clinched the win in the $1,000 Pony Hunter Classic during the Showplace Spring Classic I. Markman also rides him in the pony equitation and medal classes and says her favorite part about him is he always wants treats. She also rode her second pony, Monopoly, to a fifth place finish. Stoeckel's Jessandi Famous Amos has a resume to be admired by many. 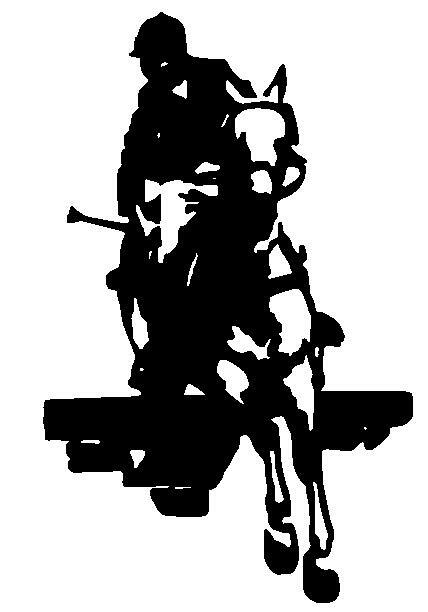 The seasoned pony has brought several riders up through the ranks, parting only because they sadly outgrow him. His performances are impeccable and he is priceless as a teacher. Stoeckel already has six championships with the pony this season. The team is going on their fourth year together and plan on attending the USEF Pony Finals and Indoors, especially since this is Stoeckel's last junior year. "He is a once in a lifetime pony and I want to soak up as much time with him as I can," said Stoeckel. "[Derby Day] was really fun," added Stoeckel. "They always try to make it fun for the pony kids and they do a good job." Alexandra Miller and Top That, owned by Emily Elek-Burtard finished in third and Austin Bauman with Prince Caspian was close behind for fourth. Markman visited the winner's circle a second time for her win in the $2,500 Balmoral Children's/Adult Hunter Derby. Photo Andrew Ryback Photography. After the victory gallop, Markman stepped up to the horses as she rode Britta Stoeckel's Tuidam to scores of 78 and 81 to win the $2,500 Balmoral Children's/Adult Hunter Derby. Olivia Stoeckel was supposed to have the ride but couldn't participate after some minor surgery so Markman got the popular chestnut for the class. "It's a lot different from a pony," said Markman. "You can see things differently on a horse so it's really fun to do something new. This was the first time I did a horse in the show and only the fourth time I rode him. Almost everything went as planned except in the handy, I turned out of the seven a little too early and I didn't get a great distance but he made it look better than it was." "I was surprised to win the whole thing, " continued Markman. "I thought they said I won the second round but then they walked over with the cooler and said I won - so that was really exciting! I definitely want to thank the Stoeckel's, my mom and my trainers for today," said Markman. Marian Sykes and Claudius earned a second place finish in the $2,500 Balmoral Children's/Adult Hunter Derby. Photo Andrew Ryback Photography. Close behind with a total of 157, including an impressive 83 in the handy round, was Marian Sykes with Claudius. 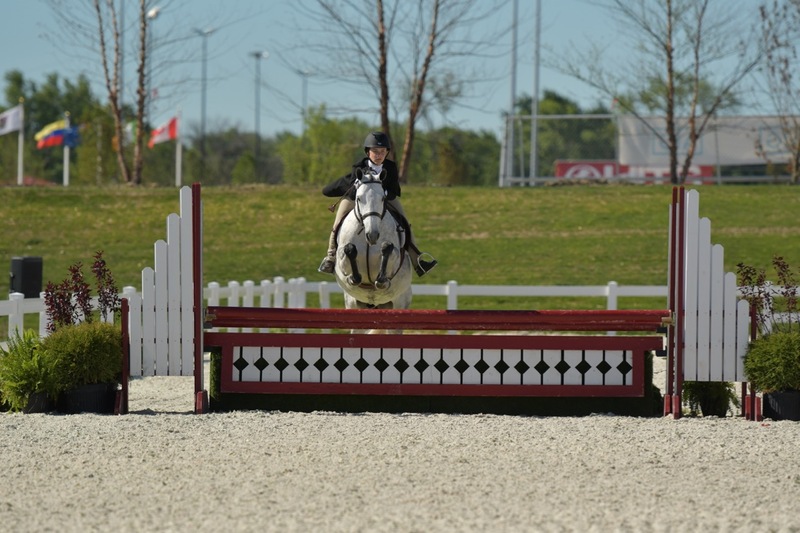 Sykes rides with Tina Judge-Boyle at Judgement Farm in Naperville, Illinois. Sykes of Plainfield, Illinois, also rode her Talladega to a fifth place finish. Dawn Kelly and come What May rode to the third place spot in the Balmoral Children's/Adult Derby. Photo Andrew Ryback Photography. Dawn Kelly and Come What May took third with a 155 and another super handy round, moving her up the ladder with an 82. After the awards ceremony, exhibitors were treated to hors d’oeuvres and a fantastic lunch, courtesy of Gene & Georgetti’s and Michelle Durpetti. The famous restaurant is Chicago’s oldest and one of the finest steak houses. They recently opened a second location in Rosemont. Fine food combined with the event planning of Michelle Durpetti Events is sure to be a great party. 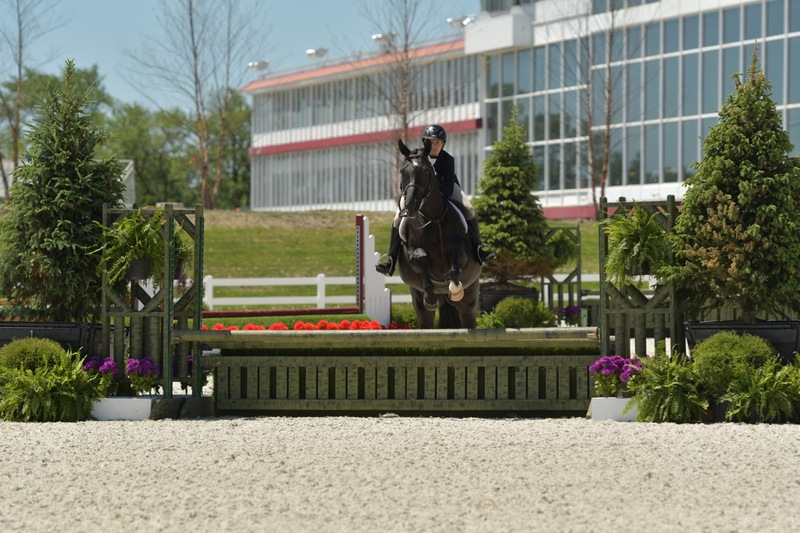 Showplace Derby Day also included a $25,000 USHJA International Hunter Derby sponsored by Bull Run Farm and a $10,000 USHJA National Hunter Derbysponsored by Galway Farm. For more news on those events click here. Trainers are hosting a fundraiser, JUMP FOR ALZ, during the Showplace Spring Spectacular. Get your arm-bands for Saturday's Best Ride of the Day competition. You can get them in the office or from Brenda at Chicago Equestrian. You can also purchase bracelets at the office and at Exceptional Equestrian. Buy from Exceptional Equestrian on Saturday and 5% will be donated to the cause. 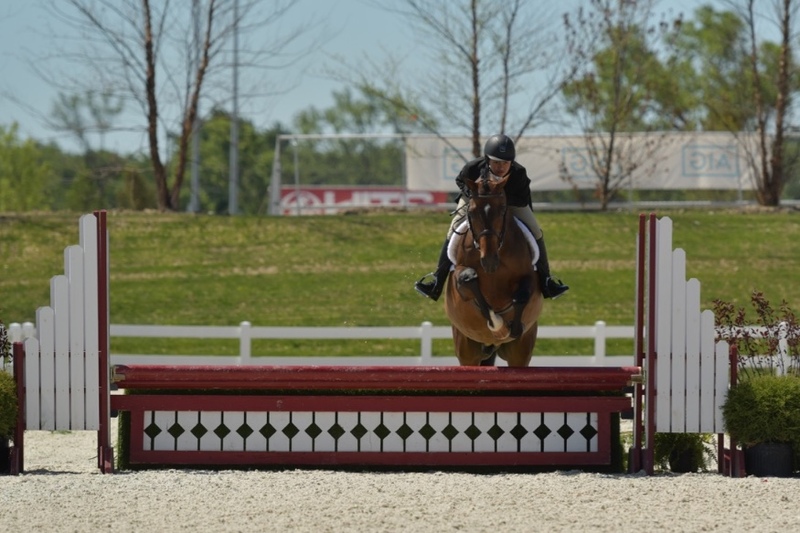 Winter Meadow Farm is located in Mundelein, Illinois, and specializes in hunters, jumpers and equitation at all levels from beginner to grand prix. Their services include lessons, training, boarding, showing and horse sales. Their facility has a heated barn and indoor area, outdoor arena and areas for turnout. Jeannine Lamb-Hugi is an experienced trainer with the ability to teach pony riders on up to grand prix riders. She is successful showing horses across the country with her riders including the Winter Equestrian Festival and Kentucky. Contact Jeannine for a personal tour or to inquire about their quality horses for sale.